The hiatus is almost over! A new season of Walking With Wired kicks off in just two weeks! After a 9.5 month super season last year, the past two months have been a much welcomed hiatus from both hiking and blogging. A needed rest for the mind and body. It’s been nice to get back into the comfortable routine I have in Portland, OR; sleeping in a super comfy bed (with lots of pillows! ), taking long hot showers, eating fresh food (I crave salads! ), substitute teaching, and of course, watching television shows. A few things are different this year upon my return. First off, since I’m only home for a couple months, and I knew I needed rest, I’ve chosen to only work one job. The past six years, I’ve been substitute teaching, and then nannying and babysitting during out-of-school time and weekends. It’s felt quite indulgent to work a 40hr week as opposed to the 60-70hrs I’m used to. I’ve used those extra hours to rest, plan for this upcoming summer, watch shows (of course! ), catch up with friends, and did I mention rest? It feels odd to have so much free time, but I’m embracing it for this short bit. Another unusual happening, is that after so many months of minimal interaction with fewer people, I am finding myself much more drained by the group interaction required to substitute teach daily. Social interaction always drains me more than physical exertion, but it has been more tiring than usual these past two months. Unusually, I haven’t been too active, just running every so often and two relaxed overnights in wilderness. I’m going with my gut on this one, and I think my body seems to want to rest. What I did last year was quite the endurance challenge, and I keep reminding myself that. I’ve allowed myself this time to be a bit of a sloth, and to eat all I desire, since I know I’m headed right back out soon. Oh the perks of thru-hiking where you can eat all you want, and still lose weight! Yes, this has been a definite time of rest…and the always dreaded planning! This upcoming season, I’ll be spending three months hiking in France, wahoo! I’m super excited about this. Even though I’ve been traveling and hiking for many years now, it still feels unbelievable to even think that I’m going to be in France and in a city like Paris that seems so iconic and unreal. This is the first of I’m sure countless future hikes in Europe. I’m aware that there are tons of hikes to do out there, and I have great friends who have done many of them, so my wish list is quite long. The ones I chose for this summer seem to be good ones for getting my feet wet over there, and gaining more comfort with traveling in Europe. I’m limited to just 3 months within a 6 month period in all of the Schengen Region, which is most of Europe, so that’s frustrating unless I jump through a lot of hoops and get creative for a long visa. I was fine with 3 months this summer, and chose hikes that would fit nicely into that timeframe. Here’s a map to get a good picture of what’s to come. I had no idea where things were situated over there until I took a closer look. In red are the Haute Route Pyrenees and the GR5. Click on the photo to see it larger. Click here to redirect to an interactive map of the routes. First, I’ll fly into Paris where I’ll do a few days of sightseeing before I take a train to Hendaye to begin the Haute Route Pyrenees (HRP), a 500mi/800km route that traverses the Pyrenees range, which runs along the border of Spain and France, from the Atlantic to the Mediterranean. Europe has a network of footpaths referred to as GR (called Grande Randonnee in France). 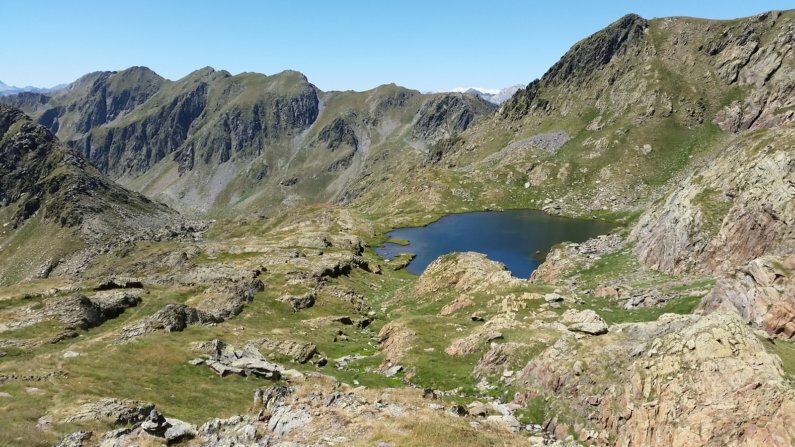 The Pyrenees mountains are world class, and highly traveled both on the Spain side (GR11) and the France side (GR10). Between the two, traversing the highest route through the Pyrenees is the HRP. The HRP is generally off trail and comparable to the idea of the Sierra High Route that I did last summer, in which the route traversed the Sierra Nevada Mountains and sometimes overlapped with the more traveled and defined John Muir Trail. I heard about the HRP repeatedly from international hikers as I hiked the Te Araroa in New Zealand this past year. All commented that it was amazing, and at the top of the list for a long distance hike. The HRP is what drew me to what I’ll be doing this summer. 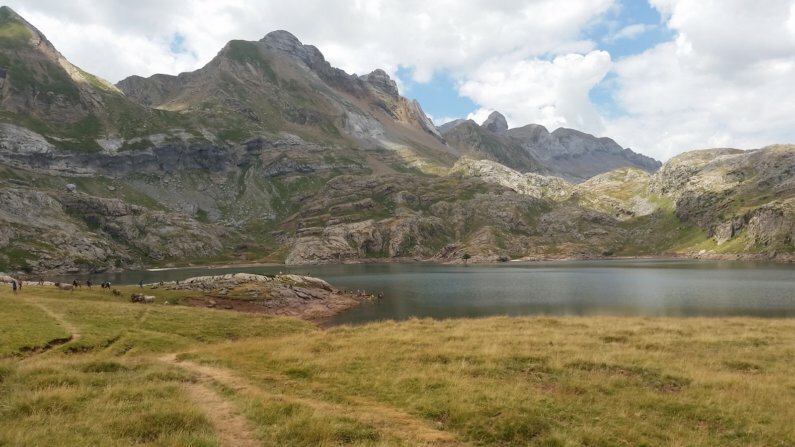 Here are some photos from Jerry, a blog follower of mine from the UK that did the full HRP last year, loves the Pyrenees, and has encouraged me for a couple years now to do the HRP. Jerry has been a great resource for my planning and I want to say THANK YOU to Jerry for all your help and for letting me use some of your great photos. Look at this place! The HRP should take me somewhere around 40 days to do. The weather out there can be the full spectrum with anything from sweltering heat and thunderstorms to freezing temps and snow. One thing to know about hiking in Europe is that there are huts or refugios along most of the popular routes. They often have many services with the option to buy prepared food and wine. Yep, this is France after all. Because of this, there’s the option to carry very little food along the way. You all know me, and my preference for solitude and keeping expenses low, so my plan is to only use the refugios when really necessary, but it’s pretty awesome and tempting to know they will be there. I will be able to resupply in small villages along the way. I will do my best to post in a timely fashion, but there may be gaps of days between service along the HRP. Here are a couple photos of the clouds that can come and on of the refugios. I won’t go into detail here, but if anyone is wanting to do the HRP and is interested in my resources and planning materials, here’s a link to what I’ll be using. I am greatly appreciative to those that have hiked this route in the years preceding me that have publicly posted helpful beta. They are featured and credited in that link. After the HRP, I’ll be near Barcelona, and may do some sightseeing there before I head over to the other side of France to hike the GR5, which is in the French Alps that run along the border of France near Italy. The full GR5 runs the whole length of the east side of France, but most who are referring to the GR5 are talking about the highly scenic and desired stretch, which I’ll be focused on, that runs 460mi/740km from Geneva to Nice/Mention and goes along Mt Blanc. This is a very popular area for tourists and will be much more traveled than the Pyrenees. It might be more people than I’m comfortable with, but it will be worth it for the scenic rewards. My friends, Gian and Laura, who I met on the Great Divide Trail and live in Switzerland recommended it (among many other hikes! ), and they provided some photos for me to use here. Thank you Gian and Laura! Man, what great photos! Follow them both on Instagram for more. I know, it’s looks pretty darn grand doesn’t it? The GR5 should take about a month or less to do. I haven’t planned that one much and think it will be nice to do on the fly using the guidebook. I should have some bonus time after that, and I’ve left that open with a few possibilities depending on the timing and my mood. 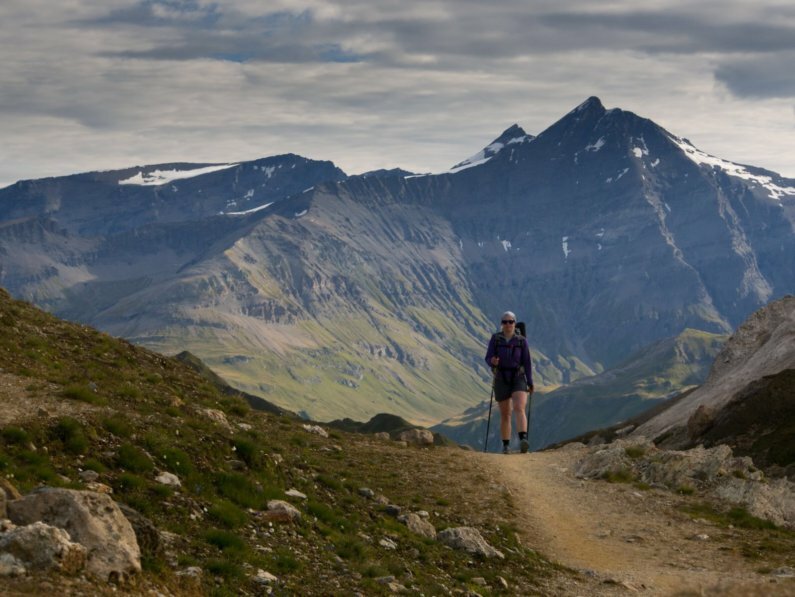 At the top of that list would be the Hikers Haute Route that goes into the Swiss Alps. I really hope I have time to finish off the summer with that one, but I didn’t want to force too much into one trip. That may take priority over visiting Barcelona if it seems that I could have enough time after the HRP. I hope so! If anyone wants to view these routes on an interactive map, go to my Where’s Wired tab. Well, that’s it for the preview to this upcoming season. It really looks incredible and I’m really quite excited about it. It still doesn’t even feel real! Two questions I keep getting that I’ll answer now is if I’m hiking with anyone and if I know French. The answer to both is NO. I know Spanish, which will help in the Pyrenees. I will learn the basic French that is in my guidebook for hiking, food, and accommodation. I have a podcast I might try to learn more from, but as I understand it, it’s more of a courtesy to start off with French and then most speak English and appreciate the initial effort. Yes, I’m lazy in that sense, and I know they hate that, but I’m kinda glad I won’t speak the same language as many out there. Along those lines, I am really excited to head out solo. I spent much of this past year with a partner in some sense, which was an intentional challenge I wanted to add to last year, but I’m ready for some hiking on my own. There are coincidentally many of my hiking friends (some you all know!) that will be out in the region at the same time. We may even overlap or cross paths, but for now, I won’t get anyone’s hopes up for reunions. There are some really fun possibilities in there that you all would love if things come together though. Yeah, now it’s killing you I know. We’ll see if any of them pan out…two weeks to go till Paris! You guys, we’re going to France!!! Welcome to europe! You will be fine with just English and a few pleasantries in French. Pity you can’t hit up the UK on this trip but its fair to say we don’t have the wilderness and big hills you need! What travel site did you use to find your cheap flight to Paris? I often get it even cheaper if I find the flights on momondo and then purchase the flights directly from the airlines’s site rather than a 3rd party. Just beware of unknown airlines and do quick review online if one seems too good to be true. Some of those lesser known airlines have reports of offering awesome flights and cancelling or rescheduling with no easy way of contacting customer service. I avoided those. Welcome to Europe and especially the HRP. I hiked most of it the previous year and have very detailed information of all stages following the guidebook from Ton Joosten. Let me know in case you are interested. Bon voyage! That would be great, Roman! I’m emailing you! Oh my, I am SO excited for your upcomng adventures! You fill my desire to be an armchair hiker and traveller. I mean, I still do my own hiking, mostly in the Cascades and Utah red rock, but following you for many years now fills my heart and soul. I look forward to your travels! Europe, oh boy! I think I’ll go clean my hiking boots …. Spanish is very useful on the HRP, especially in the early days in the Basque country, and in Andorra. In France I found that provided you first reach out, with a couple of French sentences, they will almost always take pity on you and respond in English. Yes there are lots of refuges. Many are unmanned but almost all of the staffed ones will let you eat there, and have a marked area for free camping, or just carry on a bit further.. In order to have a good time and not worry about articles or equipment—Remember–Check–Double Check–Re-Check….Enjoy Europe and keep up the great Blogs. Funny you say that cause I did that this morning to make sure there weren’t any last minute stresses…I couldn’t find my rain jacket! After 20mins of rummaging in storage I found it…hanging right where it should have been and where I originally looked, ugh! Oh the lure of the French Alps, many Americans have been drawn toward the allure of Mont Blanc, and Chamonix! That area is hallowed ground for mountaineering, skiing and hiking. How great it is that you’ll be there, will you be doing any climbing or skiing? You will be passing thru some great food regions too, and the exchange rate is in your favor. How exciting, what a fantastic way to spend the summer, so excited for you! I heard about the exchange rate ?! No skiing or mountaineering for me. At least I don’t intend to! Looking forward to this next adventure!! OMG, I am soooo looking forward to your trip. Looks amazing !!! Please keep me on your list. Thoughts and prayers go with you. Those photos are indeed killers. My kind of terrain! Looking forward to following your journey and especially finding out how it feels as a solo female. Jerry’s photos are killer!! Hope that you will enjoy and though looking in many ways like the Sierra’s you’ll have a new and totally different experience. I’m excited that you’ll spend some days in Paris. I can tell you that it is one of my favorite places in Europe. The food, museums, and parks are just stunning. Versailles is a worthy stop as are many of the fine museums including the Musee d’Orsay. I hope to return to Paris some day. Many have mentioned Versailles, so it may be added to the list even though it’s outside of the city and not in walking distance. You can take a bus; that’s what Lorna & I did when we went. We had just graduated from college and so it must have been cheap! Only half joking.. You might want to practice “He said Canadienne” at this time. Actually, I know you will represent us well, Erin. And I agree, those are stunning photos. Haha, I have a feeling I need to just say I’m Canadian to avoid a lot of conversations. Wow.. autocorrect didn’t like my attempt at Frdnch.. I do know travellers who do adopt our neighbors to the north while traveling and these days…. I am getting antsy for your trip to begin… But I am sure you need the time to prepare and double check. Yes, that’s a great slideshow Jerry! Sounds awesome. I had no idea the Pyrenees were so burly looking. Can’t wait to follow your trip! You’ll love it. 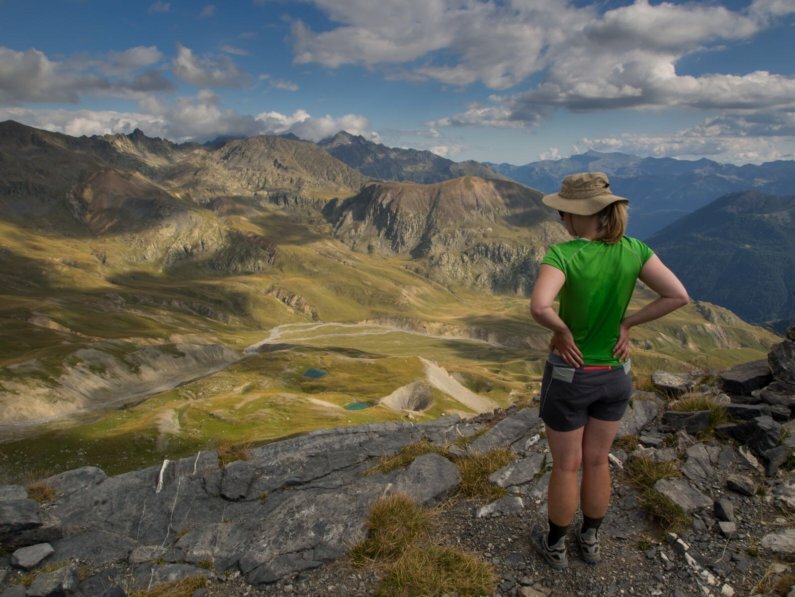 There’s a really good website hiking in the Pyrenees run by Andy Howell (www.andyhowell.info). re: learning French – I’d recommend the Michel Thomas method. But no matter; as ever, a few words and a smile goes a very long way! I hadn’t seen that site, thanks Tricky. Sounds amazing again Erin. I spent 17 days on the high route quite a few years ago (Lescun to Gavarnie) and really enjoyed it – climbing a few peaks along the way and getting stick in a refuge for 2-3 days due to snow. If you get the chance detour just before Gavarnie over to Torla nd back thro the Ordessa Canyon it’s awesome! I’ll check that out Ray. I was told teh Carros de Foc is a good bonus loop as well, but I see it’s huts only and possibly booked by the time I get there. Yes, I was waiting for that question. I feel that one is a bit over-hyped, and although it is on my list for someday, it isn’t at the top at the moment. It may be what I choose if I don’t have time to do the Haute Route at the end since I’ll already be in Nice, but it isn’t strongly pulling me. If my visa was a 10 days longer, I think I would have tried to add it in there. I like the way you party Wired. Have a blast. It will be fun to follow you. Haha! Thanks Jean! I figure I may as well make the most of it while I still can! Have fun in Europe. Will take off tomorrow on the GR20 in Corsica, a short but rugged hike. Let me know if you are near Switzerland or Blackforest in Germany. Have fun Adrain, if I do go to Switzerland, it would be mid-late Sept.
As one of your regular French follower, I have to let you know that similarly to the HRP in the Pyrenées which is a high route less traveled than the GR10/11; there is an alternate to the GR5 in the Alps. The GR5 is extremely popular, especially if you hit it in August, so I highly recommend you chose the alternate whenever possible. 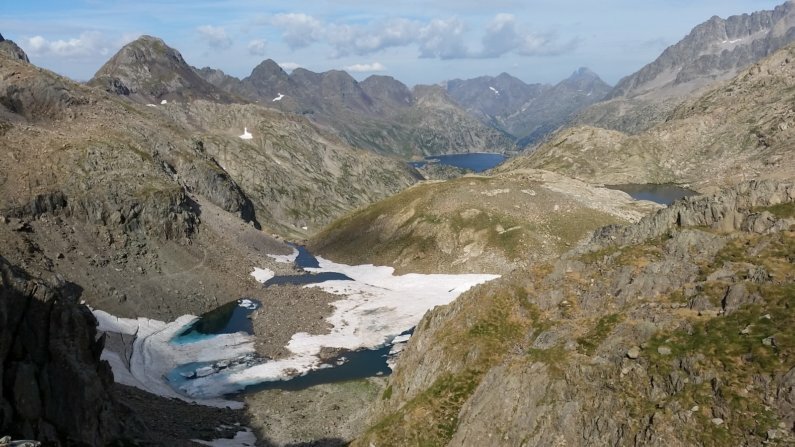 This route called “TransAlpes” is not very popular and not really advertised (which is a good thing) but you can found the guidebook on the website of its creator Jérôme Bonneaux (https://editions-montrouch.fr), though it probably only comes in French… But I guess there are GPS tracks somewhere on the web. Oh that sounds really cool Raphus. Now I wish I did know French! I don’t know that I’d be able to do it without an English guidebook, but good to know it exists and I’ll work on finding more beta. A track would be awesome to find. I emailed Jerome to ask. Thank you for the heads up! 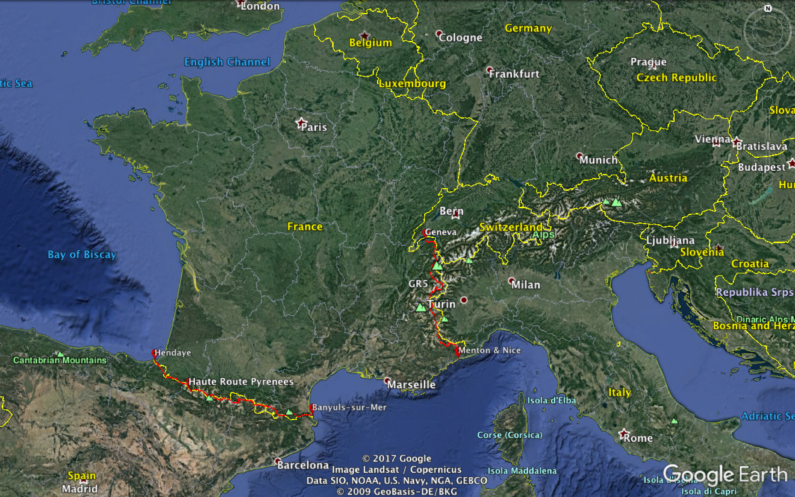 +1 for the suggestion of Raphus regarding your GR5-plan (go for the Trans’Alpes). Jérôme Bonneaux is a ‘pupil’ of Georges Véron, the father of the HRP (his route differs slightly from that of Ton Joosten). The Trans’Alpes route is constructed by adhering the same philosophy of the HRP: staying as high a possible by combining on & off trail sections, though avoiding technical climbing. If you can get hold of this guidebook, go for it. It might be in French, but the maps will often be intuitive enough, and your translation requests might be excellent icebreakers for a chat along the trail or in refuges. The Trans’Alpes shadows the GR5, so you can always opt for the latter when needed. Last but not least: you’ll probably be the first posting a non-french trip report of the Trans’Alpes! Thanks for that. I have the gpx track and a local friend recommended where to do the high routes. I will decide as I go. Hi, been following you since 2011, first time commenting. If you don’t want to or have time to go all the way to Barcelona, Nimes, France is a wonderful place with easy sight seeing stuff nearby (Avignon and Pont-de-Gard). You might also consider Girona, Spain. It’s on the way to Barcelona from southern France on the train. I lived in Barcelona for a semester and have gone back the last two years. I love it and the catalans. Have a great time in France. I hiked the Robert Louis Stevenson Trail (GR70) in southern France. My husband and I never met another American while on the trail. Everyone was friendly and helpful, even though our French is minimal. We found using google translate very handy. Looking forward to your blogs, as always. Oh thank you for that info Laura. I wish the visa was just a couple weeks longer so I could easily fit it all in. Barcelona will be a gut decision at the time. If going there means missing out on hiking in Switzerland, I’ll probably choose the hiking. I know that people think I can always come back to do the hike, but I tend to view things assuming I won’t be back, because you never know. If I won’t be back there, I want to prioritize the hiking, but hope to also have time for some town/city stuff too. Always great to hear from someone who’s been there since the beginning. It’s been quite the ride! Will be interesting to see you how you get on wild camping on the GR5. 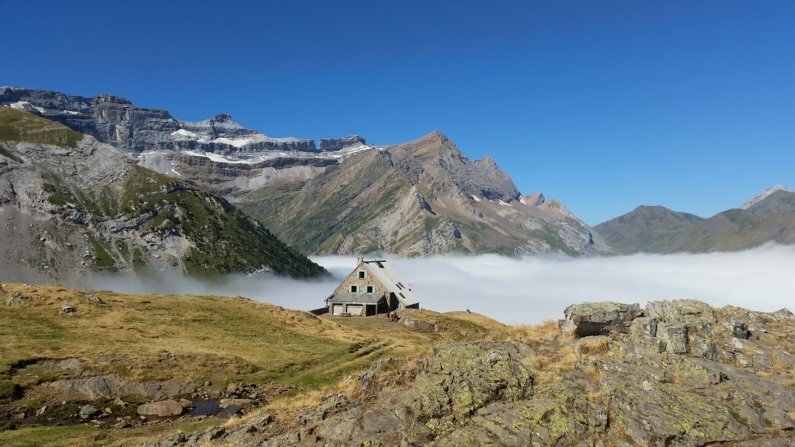 Unlike in the U.S. it’s not really the local culture to camp on these French routes as most hikers stay in the refuges. I even think wild camping might be forbidden in some of the French national parks too, but not sure how or if this is enforced. That said, the refuges can be expensive, booked out in July & August and very crowded, so I’d certainly carry a tent! 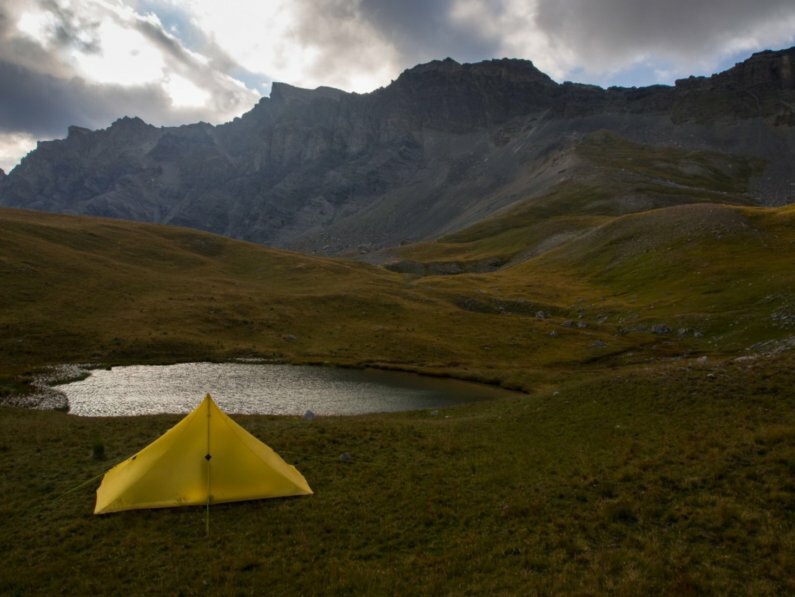 In the Pyrenees there is no ban on discreet wild camping overnight by walkers anywhere, including National Parks. It would be impossible to enforce anyway, as we don’t have rangers as the US does. One or two Spanish refuges dislike camping right next to them, but mostly free camping areas are available next to refuges so you can eat there and sleep outside. I haven’t spent much time in the Alps, which are generally busier than the Pyrenees especially on well-known paths like the GR5. But I doubt if the French Alps would be much different. No, most hikers do not stay in the cabins and wild camping (or rather “bivouac” as we call it in French) is widely used in the mountains. In some places (e.g. along the TMB “Tour du Mont Blanc”), it may even be tricky to find a good place to camp given the amount of people present along the trail ! 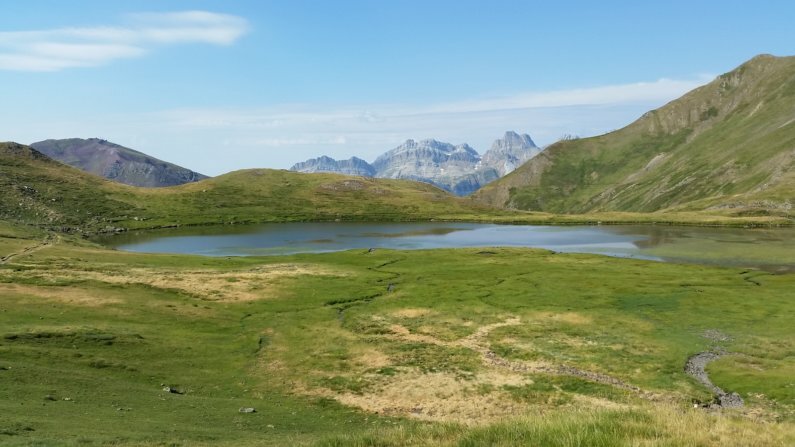 But it is true that some parks forbid (and enforce) wild camping, in particular the Parc de la Vanoise and some parts of Mercantour NP (e.g. Vallée des Merveilles). But the restricted areas are rather small and one can usually easily camp at the border during a thru hike. You are right about the price of refuges, it is also hard (and expensive) to resupply there, it’s better to go down in the valleys to resupply. But your plans makes me thinking again about the HRP. I have dismissed it because it afraid me a bit : I think it is tough. May be I will put (a part of) it again on my list. Be aware of how to behave if you see a patou (sheepdog). Certainly you will see some. They are impressive but applying the advertised behavior works. I even have been waking up by one, barking and turning around my tarp, near the Mercantour. I am impatient to read your views of GR5 and HRP. Yes, I don’t expect it to be as remote as what I’ve experienced here at times, but it’s definitely picturesque! I also found a route along the GR5 that will give me options to go off the beaten path more if I like. Kinda like the HRP for the GR5. Glad to have that option. I met an American when I did the HRP, who had completed the AT in 2014. Sean, from Washington DC. Seems it might be getting more popular! I also met a few patou .. highly unpleasant dogs, they are trained not to attack, but they do everything else but .. keep well clear of flocks of sheep, is my advice. I’m NOT looking forward to that! I will totally enjoy following you on this next adventure – the terrain so different to last years trails. Safe travel. The best places to stay in Europe are youth hostels. In France there are gites d’etap in most towns for 15-20 euros. Regular gites are B&Bs. Camping is not easy in the mountains because of rocks, slopes, and tall vegetation. Alpine huts are 50e but include 3 course dinner and breakfast. wine and showers are 3e. Supermarkets are closed on Sunday in France. Every French village has a boulangerie/bakery, but not a grocery or gas station. Sometimes trail junctions are not well marked. Rain can be heavy and all day. The GR5 is quite crowded around Mt Blanc only, where you may need reservations in the huts. It really goes all the way through the Netherlands. For a real challenge, try the Via Alpina red trail from Nice to Slovenia for 3000 miles. The Via Alpina is on the life list! Really the first time that I read your blog. Got it via gossamer gear. Leaving in Toulouse, France, I highly recommend the Pyrénées, i am sure’you will enjoy. Another one that you should consider is the Corsica GR20 not as long as hrp or GR 10 or 5 but quite physical but beautiful. Onwards and upwards. Have a great trip! You will love it! Did both those hikes 30 years ago. If you have the chance, go to the Trois Frere’s cave for the fab rock art which is about 13,000 yrs old and not too far off your route when you finish to spend another day :-). Along with the Highlands of Scotland, the Pyrenees is a place I would live if I didn’t live where I do :-). Looking forward to hearing more as you go and after you get back. Am completely envious !!! And you have the best gear in the world to do it all with too. Oh you have me even more excited Elen! Not sure how timing will go, but I’ll keep them in mind.